Review: The American Civil War is an unforgettable American event that claimed more lives than any other war in U.S. history. Full of lively anecdotes about George H Thomas, Ulysses S. Grant, William Sherman, President Lincoln, and the lives of every day soldiers, The Battle of Nashville captures the passion and drama behind the military strategies of the Civil War. In this highly readable and moving book, filled with photographs and original documents, Benson Bobrick examines both General George H. Thomas and a battle (which is often overlooked) that was instrumental in reuniting a nation. The book includes a chapter on General Thomas (biography) as well as a chapter on the life of an everyday soldier. These two chapters are just two of many informative chapters well written in this book. Bobrick has done a great job of including photographs with his writing. These photographs helped me visualize what actually took place because of how graphic they were. Wherever there is a photograph, there is an explanation of what the picture shows, why it is important, and the date the picture was taken. 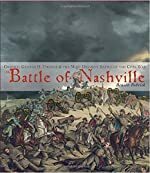 The Battle of Nashville kept me interested in what I was reading, and the writing was very clear. Bobrick did a great job of highlighting the military choices that saved the Union, as well as the causes of the war and the personalities who have shaped our understanding of the war today. One of the interesting facts that I learned is how some United States Generals were willing to sacrifice two soldiers to kill one enemy soldier. Stories of past wars interest me greatly, and Bobrick definitely did a great job keeping me interested throughout this book. I would recommend this book to people who have an interest in learning about past wars. I give The Battle of Nashville five out of five stars. We would like to thank Random House for providing a copy of The Battle of Nashville for this review. Have you read The Battle of Nashville? How would you rate it? nice article thanks for sharing... and 'The Battle of Nashville' is different from other i love this.